We offer an Extended Fall Share for 4 extra weeks in October for $140. There will be 8-12 items each week, which may include a variety of Cooking Greens (kale, collards, tatsoi, spinach), Salad Greens (baby lettuce, arugula, spicy greens mix), Brassicas (Brussels sprouts, cauliflower, broccoli, cabbage, kohlrabi), Roots (potatoes, carrots, radishes, beets, rutabaga, celery root, turnips), Fruiting Veggies (winter squash, tomatoes, peppers, mushrooms, dried beans), and Alliums (garlic, onions). You will receive a weekly newsletter by email at the beginning of each week describing your share items, cooking and storage tips, important dates, helpful hints, recipes, and feature articles from the farmers. See other sections of the website for more details about this share including pick up days, locations, and times. Watch for the specific dates when registration opens on our Events Calendar. The Thanksgiving CSA Share will be available for pick up on the Saturday before Thanksgiving at the Ann Arbor Farmers Market from 7 AM until Noon or at Tantre Farm from 2 until 5 PM for around $120 (specific cost will be determined closer to the start of the season). You will receive a newsletter with storage tips and recipes for 60 to 80 pounds of multiple varieties of some of the following: potatoes, cabbage, winter squash, pie pumpkins, garlic, Brussels sprouts, beets, onions, carrots, kale, collard greens, spinach, Asian greens, cauliflower, broccoli, dried beans, rutabaga, and turnips. A special addition to our share is usually a jar of locally-grown, lacto-fermented veggies (some from Tantre Farm) from a local business called The Brinery (www.thebrinery.com). Watch for the specific date when registration opens on our Events Calendar. 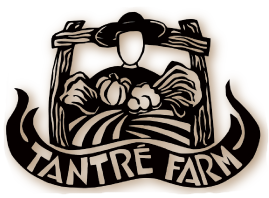 Entice your soul with a Solstice Share from Tantre Farm to be picked up on a Saturday in mid December! If you would like to offer the perfect gift for the person, who has everything, why not try a Solstice Share for around $100 (specific cost will be determined closer to the start of the season). This mid December share is in honor of celebrating the longest night of the year and the beginning of the countdown for summer with pick up at the Washtenaw Food Hub from 9 AM – Noon, Tantre Farm from 2 PM – 5 PM, or at Argus Farm Stop-Packard from 8 AM until 6 PM. Every year is slightly different, but in the past we offered the best from our root cellar for roasting, slaws, and soups, including purple and orange carrots, beets, potatoes, Daikon radishes, watermelon radishes, and Brussels sprouts. We also had kohlrabi, kale, winter squash, pie pumpkins, and onions. As a special addition we collaborate with other local artisans and farmers to round out the share with something different every year such as: a bag of tender, organic, baby micro-greens from Garden Works, a loaf of artisanal bread, a jar of tasty, lacto-fermented surprises from The Brinery (www.thebrinery.com), a savory, prepared food dish from Harvest Kitchen (www.harvest-kitchen.com) and organic apples from Mana Farms. The Winter Solstice Share is our way of celebrating the end of the year’s harvest, as we head towards the shortest days of the year. This is a share that will sustain your winter hunger and cleanse the indulgent palette. Watch for the specific date when registration opens on our Events Calendar. We would like to offer you the warmth and sustenance of our Shakespeare-inspired, Midwinter Morning’s Dream Share available on a Saturday in February at the Washtenaw Food Hub from 9 AM – Noon, Tantre Farm from 2 – 5 PM, or at Argus Farm Stop-Packard from 9 AM until 6 PM for around $95 (specific cost will be determined closer to the start of the season). We are excited to be combining our efforts with several local food artisans and farmers again to further strengthen our vision with the power of local networking through our Dream Share. Every year is slightly different, but in the past besides some combination of Tantre Farm’s root cellar vegetables (beets, potatoes, parsnips, daikon radish, onions, winter squash, carrots), this share has featured a loaf of artisan-made bread, a quart of soup from Harvest Kitchen (www.harvest-kitchen.com), a bag of frozen blueberries from Locavorious (www.locavorious.com), a jar of the Brinery’s (www.theBrinery.com) sauerkraut, and a bag of tender, organic microgreens from Garden Works Organic Farm. This share is not distributed during the midsummer time of a Midsummer Night’s Dream, but rather in the “midwinter” dreams of February. Perhaps you will enjoy a “Shakespeare-inspired” Dream Share to shake away the winter doldrums. Watch for the specific date when registration opens on our Events Calendar.